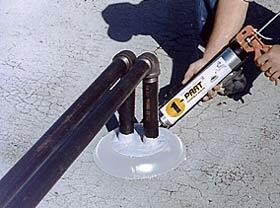 We offer ALL types of pipe flashing systems, roof penetration flashing and sealing solutions. They are field proven for sealing all types of roof penetrations. Our large inventory includes EPDM and Silicone Pipe Flashing Boots, High Temp Silicone Pipe Boots, Deck-Mate, Master Flash, pipe portals (multi-pipe flashings), Retrofit Pipe Boots, Solar Pipe Flashings, A/C multi-pipe roof flashings, ChemCurb Systems, roof jacks, curb seals and roof bellows. Roof seal systems include rubber roof flashings designed for use with copper vent pipe flashings, steam pipe flashing, lead flashings, metal roof pipe flashings, neoprene flashings, roof vent pipe flashings, chimney pipe flashings, shingle pipe flashings and TPO/PVC We also carry types of retrofit storm collars, retrofit pipe and penetration flashings, including items for square-tube and angle-iron roof penetrations. We specialize in Master Flash, Deks, Deck-Mate and SpringSeal rubber flashings and inventory all sizes. These rubber flashing boots are easy-to-use and feature a 20 year manufacturers warranty. The rubber flashing boots are available in both EPDM and Silicone materials, and in colors. The Retrofit Pipe Flashing Systems and retrofit storm collars enable you to quickly wrap and permanently seal existing pipes such as air conditioning pipes, conduit, hot water gas flues, chimney pipes, etc. For service entrance flashing, use Retro-Spin flashing Kits. 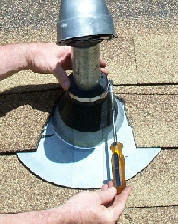 For shingle roofs, we have easy to install Shingle Roof Pipe Flashings. Chemcurb Systems are used for multiple pipes, difficult retrofits, odd sized roof penetrations and replacements for all pitch pan type seals. New low cost Mini-Curbs accommodate smaller sizes and come in a kit complete with everything to seal 10 areas. More ChemCurb Info. We also supply expansion joint covers. Inventory includes covers & seals for roof to wall expansion joints, curb mount / curb flange expansion joints, corner and crossover expansion joint covers, straight flange expansion joint covers and combination flange expansion joint covers. NEW: Top of the line lead pipe flashings, lead roof flashings, lead vents, lead scuppers, lead sheet, lead scuppers, lead plumbing vents and other lead roofing products for the longest life performance. Master flash silicone rubber pipe boot flashings systems are available in many sizes. They can operate at very hot or cold temperatures -- up to 437F continuous and 500F intermittently. Silicone Boots are used for hot pipes, extreme environments and in corrosive applications. The Retro-Split Storm Collar, available separately, 'splits' open, allowing you to wrap it around the penetration. Once tightened with a hose clamp, you have a clean and effective waterproof assembly, as shown in figures 1-3. The Chemcurb system consists of a tough, 2-inch deep poured-rubber-seal into a surrounding curb which bonds to the roof surface (compatible with EPDM, PVC, BUR, coal tar, SBS modified, granulated APP, many types of coated metal and FRP). These easy to install systems are useful for retrofits and odd sized or difficult penetrations. 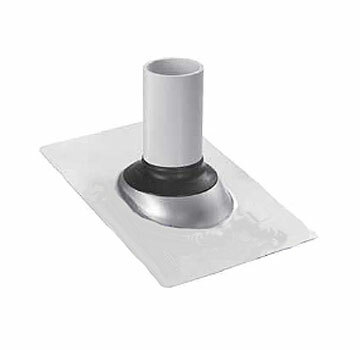 They are recommended replacements for all pitch pan seals on new and re-roofs. 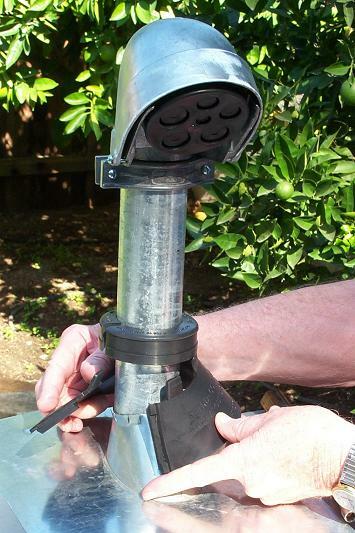 New MINICURBS enable cost effective sealing of small pipes and irregular or multiple penetrations such as HVAC conduit and drains, exterior lighting supports, surveillance cameras, mounts for solar panels and light angle-iron struts. Curb components are made of pre-cast polyester composite or black structural urethane for saw cutting and can be configured to fit every shape and size of penetration! Product Datasheet on configuration and installation. M-1, the bonding adhesive included in the ChemCurb System, is a tough, thermosetting adhesive capable of bonding steel deck to bar joists and metal sandwich panels to roof and wall purlins. M-1 develops 300 lbs. per square inch of shear strength on metal, masonry and wood. It is capable of 300% elongation and can accommodate dimensional changes in construction materials down to minus 20 degrees F, and is solvent free. Available in Black, Gray, Limestone, and White. 1-Part Pourable Sealer is a moisture-cure self-leveling high performance sealer applied with a 1-quart caulking gun (available in re-sealable 2-liter pouches for larger jobs). It's designed for use in warranted ChemCurb penetration seals, and can be used in non-warranted metal pitch pans. Available in Gray only. The Portals Plus pipe portals systems includes Alumi-Flash and are compatible with all types of roof systems. 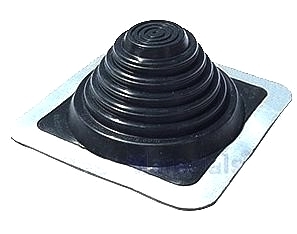 Due to the flexibility of the EPDM rubber caps, roof leaks are eliminated because penetrations are allowed to expand, contract, and vibrate independently of the waterproofing. Special retrofit caps are also available from which accommodate a variety of pipes, tubes, and angle irons from .375" through 12". The caps are molded EPDM (Ethylene Propylene Diene Monomer) rubber which is compounded to resist degradation due to oxidation or exposure to ozone and ultraviolet rays, while having a serviceable temperature range of -60F to +270F. The caps are mechanically sealed to the Alumi-Flash base with a double "Weather-Tite Pressure Seal", which consists of two (2) beads formed into the collar that mate with the double grooves on the inside of the caps. Together, the Portals Plus cap and base provide a permanent, watertight and maintenance free means for penetrating roofs that is simple and easy to install. Solar and A/C multi-pipe flashings in all sizes for all roof types. DekStrip: Very durable TPE rubber flashing for large, curved or irregular profiles. 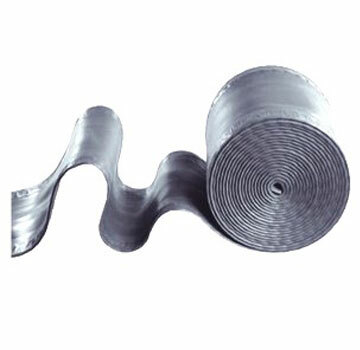 Available in 7 to 18" widths and 33 or 75 foot lengths, with a 25% stretchable molded-in edge reinforcement. More Information. Technical information about caulks and sealants can be found on our caulks and sealants page. SIZING PIPE FLASHINGS: Most call-out sizes are based upon national standard pipe sizes (NPS). Copper and brass pipe dimensions are different.